Located in the South-West, Kerry is Ireland’s 5th largest County. The main industries in Kerry are tourism and farming with some of the larger towns boasting a variety of factories and small industries. Quick facts about County Kerry. 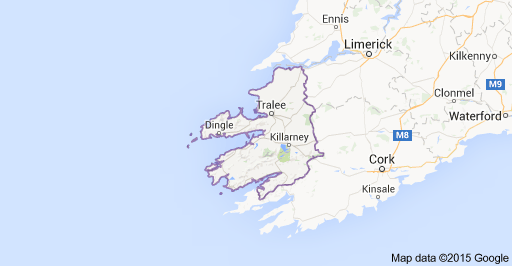 Kerry has over 6,000 Irish language speakers, with close to 5,000 living in the Kerry Gaeltacht areas. Kerry boasts Ireland’s highest peak, Carrauntoohil as well as Mount Brandon in the West. With over 400 km of coastline and a huge array of mountains and hills, Kerry welcomes the adventurer and the trill seeker. With the rise in popularity of cycling over the last few years, Kerry has very much kept pace with it’s demands. The now legendary Ring of Kerry cycle started 31 years ago with a very small group of friends looking to raise money for charity. Now it has 11,000 cyclists coming from all over the World, to enjoy the magic of this famous route. Add to that the various cycling clubs that are now dotted around the County and with each one comes their own sportive. This gives the visitor a chance to discover the county via the local knowledge of the participants. For the more independent minded there are over 400 km of coastal roads waiting to be ridden via the Kerry stretch of The Wild Atlantic Way, not to mention roads and passes over our various “smaller” mountains. Oh and don’t forget the labyrinth of sleepy country lanes, offering colour and nice surprises around every corner.